Ryan Tank analyses the mid-week Bundesliga match that ended Schalke 0-3 Bayern Munich. Schalke 04 started quite well; the first two lines of their press were coordinated well and managed to force turnovers within FC Bayern’s half. But, as the time went by, slowly but sure, Bayern found the rhythm and gradually dismantled the hosts’ uncoordinated press. James Rodriguez was amazing, but apart from that, particularly in the second half, Schalke were just not good enough to deal with Bayern’s possession play. Domenico Tedesco fielded a 5-2-2-1 with a transition to 5-4-1 during the low block. The principle of press was to force Bayern to play as many long balls as possible. Thus when Schalke looked to establish a high block with Guido Burgstaller; he was supported by the two wide midfielders to press Bayern’s first line of build up. At times, when the access was possible, both wide midfielders would directly press Bayern’s central defensive duo with Burgstaller running towards Sven Ulreich to force premature long balls. Schalke used their first line to set the pressing behaviour. When both wide midfielders managed to contain the passing option from Ulreich to both central defenders, as said above, the central nine would go directly to Ulreich. To maintain the stability within their press, both of Schalke’s wing backs oriented to both Bayern’s wing backs. With this, Schalke also blocked the wide outlet since they had kept the central lanes under control. The central area itself was secured by Nabil Bentaleb and Weston McKennie who had to stay close to Bayern’s double pivot. This made the away side reluctant to insist developing the offense through the central area. Until this stage, Schalke managed to create a strong central blockade. To deal with such a pressing behaviour, as expected, Bayern’s wide men (Kingsley Coman and James Rodriguez) would drop deeper. There was a ‘hole’ behind Schalke’s wing backs who moved high up the pitch to keep his assigned opponent isolated. By occupying to the said ‘hole’, Bayern’s ball side wide man wished to provide the passing option for Ulreich to bypass Schalke’s high block. It was good idea and an ideal tactical decision, but Schalke’s press could handle it as the onward press by the ball side half back would have managed to keep the Bayern’s receiver under control (see Thilo Kehrer, Daniel Caligiuri, and Kingsley Coman below). From this situation, Schalke regained possession. Unfortunately for them, the next offensive actions (mainly turnovers, bad passing, bad timing in short combinations, etc) had stopped Schalke from generating more promising attacking situations. Had Schalke not been able to generate such a high press up the pitch, the block would drop off to a middle block while the central nine oriented himself to Bayern’s six space supported by both wide midfielders who kept it compact by staying close to the central midfielder players. In such a situation, the possession team used the wide area to create the opportunity to generate progression access. A pass to the near full back followed by a back pass to the initial passer might generate the desired lane. To deal with this, the defending team have to make sure that they make the right horizontal shift supported with adequate cover from lines behind the first line as it could prevent the on-possession team to progress. 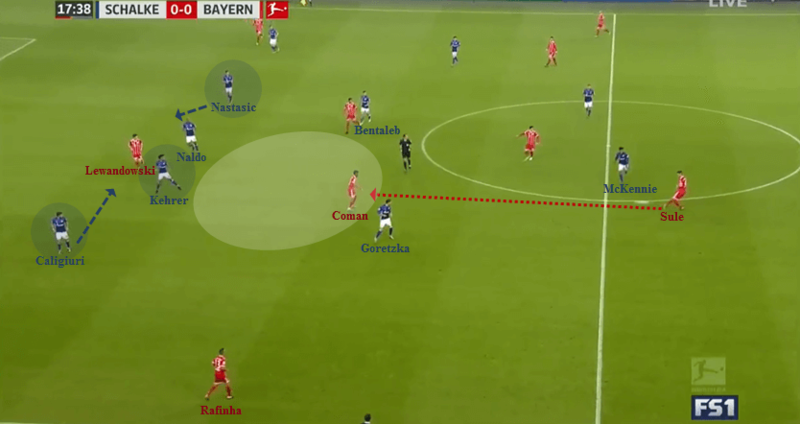 As shown above, Schalke did manage to isolate Bayern’s circulation but, here an interesting tactical situation emerged. From the similar situation Bayern could find the free man who occupied the sector of the far side full back. Carlo Ancelotti’s boys kept shifting the ball from side to side. They also narrowed the central area which enabled them to manipulate Schalke’s press as it might open the space on the wider areas. With a patient combination among two or three players in the half space, Bayern tried to create inattentional-blindness in Schalke’s defense as it was part of the plan to create space for Thomas Muller to receive medium deep passes. Sometimes, Bayern even tried to utilize long deep passess – usually by the free player who occupied the half space – to access the opponent’s 18-yard box. One of Robert Lewandowski or Muller being the passing target. But, again, Schalke could deal with this quite well. Naldo and co managed to claim the second ball – after an aerial duel – as the central midfield duo could establish an ideal vertical compactness which ensured more safety in the second ball battle. As mentioned above, Schalke’s pressing coordination gradually showed its weakness. One of the root-cause was the individual over-zealous press. This especially could be indentified by taking a closer look at Leon Goretzka’s defensive action. The German international made the same (mistake) over and over as he decided to make an onward press directly to the near central defender instead of staying on his post. This might be the side-effect of the pressing principle which the central forward and the wide midfielder were tasked to occupy Bayern’s first line in the first place. 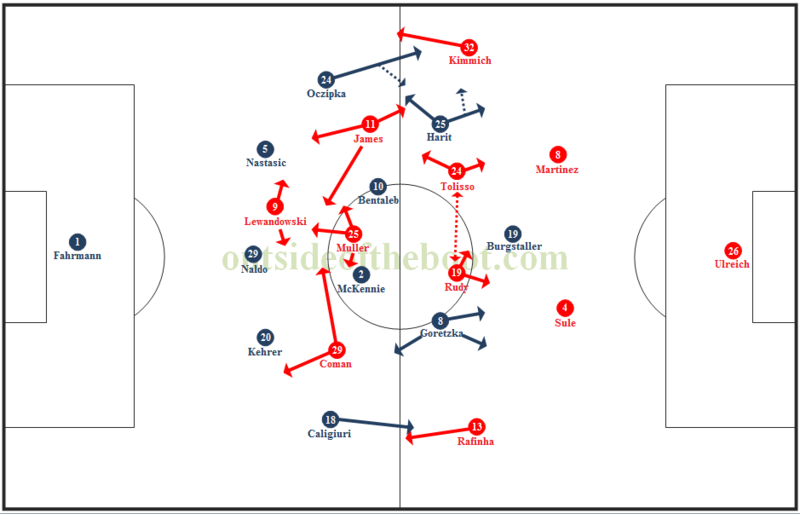 But, whatever it was, such a pressing behaviour helped Bayern to generate valuable space in crucial areas. But, on top of all, the (lack of) collective coordination arguably was the biggest reason to weaken Schalke’s pressing system. Not enough cover behind the pressing line as a result of the lack of onward press by the back line players, in turn, ruined the oscillation of Schalke’s block. This is one of it. Kehrer seemed too reluctant to make an onward press to Coman, as he might calculate the threat of Lewandowski who occupied the space between him and Naldo. But, in fact, there was Caligiuri who can cover Kehrer or, for the alternative, had Caligiuri moved wider to occupy Rafinha, Mateja Nastasic – as the far half back – should be able to provide enough support for Naldo. Good for Schalke because Naldo could handle Lewandowski well as it ended up with a corner kick for Bayern. On the other occasion, Bayern gained the opportunity to use the six to bypass Schalke’s press. This usually resulted in Schalke shifting from the wide area and back to the center. Here the coordination was slightly ruined as the wide midfielder along with the central midfield duo oriented to secure the eight space while the central nine stepped forward to put press on Bayern’s central defence. As a consequence, Bayern gained a big space at their six as the lack of vertical compactness from Schalke allowed them to. A pass from the first line to Rudy followed by a pass from Rudy to the ball sided full back enabled them to attack the near half space. This was usually followed by the wide man receiving in the said half space. The instruction to make the half space as the strategic room to create progression access was well-practiced by Bayern’s attackers. Coman and especially James Rodriguez were superb in applying such a tactic. The two were often found occupying the half space to connect with Lewandowski who dropped to the space behind Schalke’s middle-line in the center. In many occasions, Bayern started this tactic by circulating to a certain sector of the pitch then gradually switching it to the opposite area. The ball was played from the wide area to the central defender, then laterally played to the far full back. Here, the advanced wide man on the same side would drop to occupy the near half space. The positioning of the said wide man in this half space often dragged Schalke’s pressing orientation and triggered a collective onward press. This in turn widened the vertical space between Schalke’s middle-line and the back line. Such positioning by the wide man in the half space was strengthened by Lewandowski who often found the right timing to occupy the central area behind Schalke’s middle-line. And it was even harder to defend against because the attacking dynamic was still able to be developed as James/Coman’s vertical runs were able to provide the chance for a short combination with Lewandowski in the intermediate-defense of Schalke’s. This tactical principle made its maximum effect in the 23rd minute. A patient circulation, a switch play, a half space interplay, another gradual switch, and a third man run resulted in a penalty for Lewandowski to slot the first goal. Bayern’s press was formed by a basic shape of 4-4-2/4-4-1-1. There were times when Schalke could progress the circulation and forced Bayern’s high press to drop to the middle one. Schalke seemed to try to use the half space and flank to create progression in the final third. Some diamond that established by five players was basically an ideal one to generate short combinations and manipulated Bayern’s overload. But, the issue was it practically weaked since there was not enough dynamism to destabilized Bayern’s overload. This, in turn, as expected, forced Schalke to play it back and recirculated it through the back line but only to be followed by another static position. In the ball recirculation and when the ball is switched to the weaker side, the on-possession team should be aware that they need to penetrate into the crucial area with more decisive movement and passing play. The reason is simple, it is the weak side where there is no string overload as it could be found on the opposite field side. But, again, Schalke couldn’t comply to the requirement and made it highly possible for Bayern to gain the numerical superiority more easily. As the second half rolled, Tedesco’s boys showed some improvement. Particularly in the pressing coordination. There was no lack of onward press and the compactness could be maintained well. Around this stage, there was a hole in Schalke’s press that allowed Bayern to bypass the first two waves of Schalke’s press, but the cover by the back line was still able to stop Bayern from progressing. And, the last important point was, attacking-wise, Yevhen Konoplyanka made a better performance compared to Amin Harit during the first half. But, again, as the 2nd half went by, Schalke started to show the similar problem they were suffering from in the first half. 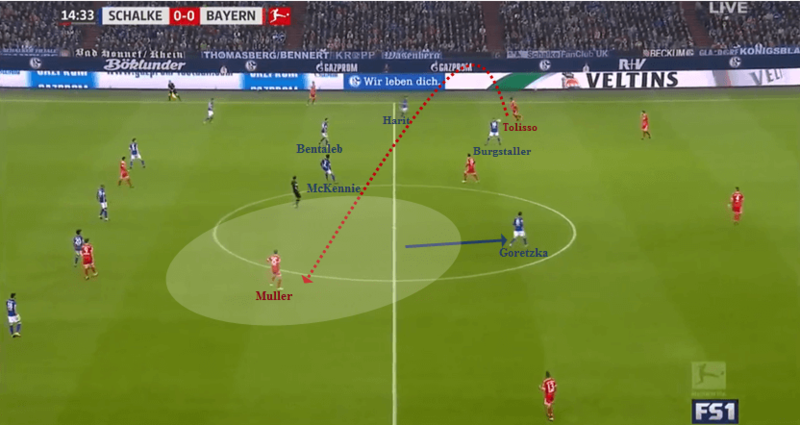 Bayern’s double occupation in the half space of the middle third, for instance, managed to provide progression option for their first line to by pass Schalke’s press. Lewandowski filled the available space to act as the outlet. His positioning often supported by Bayern’s near wide man who along with him made the said double occupation. As you can see, there was Coman behind Lewy. The Frenchman supported Lewandowski by engaging with his marker which managed to free the Pole. The other important point in this overload was the positioning of Tolisso and Rudy. These two players enabled Bayern’s circulation to be developed better. After Lewy received the pass, he played a simple short pass with Rudy followed by another simple short combination between Rudy and Tolisso. All this combination dragged Schalke’s block to the right side which enabled Bayern to switch to the far half space, to Joshua Kimmich. Bayern could even be more comfortable to switch from side to side. One of the ultimate cause was the lack of cover by Schalke’s far side player. There was a Schalke player to keep Bayern’s far side player under control but sadly the positioning and the intensity were ridiculously bad and allowed Bayern’s far side player to easily-receive after the switch from the opposite field side. To this point, it can be said that Schalke was already done. The same problem went to their possession-phase. Against Bayern’s high press Schalke failed to establish a strong enough spacing. The distance between the second line to the final line was too far and made it hard for them to gain a clean ball progression. Having a problem with their compactness, Schalke seemed to be unable to match Bayern. Coman “needle-dribble” often enabled him to get through the press and create big attacking spaces. In the six space, Rudy reassured the security of Bayern’s off-possession phase. Bayern’s circulation to the wide area, back to the defensive line, and then followed by a vertical pass to the six at times helped them create a numerical superiority at Schalke’s six. The triangle of Rudy, Arturo Vidal, and Thiago Alcantara kept Bayern to be able to control the central area as well as creat space for the ones in the half spaces and flanks. The third goal was the ultimate example. Bayern’s back line could easily access Rudy at the number six space. From Rudy, the ball diagonally-played to Kimmich in the flank in the final third. When Kimmich played it laterally to the near half space for Thiago, there was a big space for Bayern and at once a 2v2 situation occurred, between Thiago-James against two of Schalke’s defenders. A little scrimmage between James and Schalke’s back line resulted in a ball recovery by James which ended up with an assist by the Colombian to Vidal.